Hours: The Florida Gardens is open every day from 7am – 7pm all year round. The Welcome Center is open Monday through Friday from 8am – 5pm. In addition to the many wonderful gardens and display areas listed below, the FBG in Pinellas County also has over ninety acres of natural preserved lands that include oak forest, pine flatwoods, wetlands, and endangered scrubland, all managed right here within the grounds. The Florida Gardens has built numerous retention ponds throughout the grounds that help to filter all the runoff water from the developed portions of the Gardens, before it ultimately finds its way back into McKay Creek. These retention ponds have become amazing habitats for local wildlife. The Gardens have documented over one hundred and fifty types of reptiles, mammals, and birds across the grounds. Among these many animals, guests to the grounds may be lucky enough to catch a glimpse of a few threatened or endangered species as well including the Sherman Fox, Gopher tortoises, and even Bald Eagles. These grounds are also home to quite a few plants that are considered endangered species as well. The Florida Botanical Gardens has set aside almost sixty acres of land on the eastern side of the grounds as part of the Natural Area, and approximately thirty acres along the southern portion of the Gardens are being restored back to nature after nearly a century of disturbance my mankind. 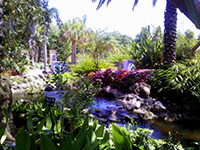 Here are some of the many features you will find at the Florida Botanical Gardens. Patio Garden: This garden is an amazing resource for any home gardener looking for ideas and inspiration for their own gardens. Visitors will find all sorts of creative ways of landscaping and plant display. The ideas in this display include gazebos, colorful and richly textured foliage, plants sure to stimulate the sense, as well as implementation of waterfalls. Herb Garden: This intimate little garden in the Florida Gardens is sure to delight its visitors with attractive colors and rich scents and smells. Herbs have had a long standing role in human history. Mankind has found countless uses for these plants for culinary and medicinal purposes, as well as many plants that had ceremonial purposes. Tropical Fruit Garden: There are very few people who have not enjoyed tree grown fruits, but how many people actually understand how these trees produce their bounty? The Tropical Fruit Garden contains well over a dozen varieties of plantain and banana trees. Guests can learn how pineapples are grown, as well as learning where sugar comes from. Other citrus tree are also represented here like the papaya and mango. Native Plants Garden: This native garden in the Florida Botanical Gardens is a fantastic resource for anyone interested in starting a garden with plants native to this particular region. Growers can learn how to interplant shrubs and groundcovers, trees and wildflowers. Each of these groupings will have their own unique palette suited for their own seasons. Seasonal Plantings Display Area: This area of the Gardens is used for trials of many bedding plants, which puts on quite a spectacular display of color and foliage for most of the growing season. The Gardens also uses this area to grow organic produce that is then sent to the Green Market in the fall and winter months. Succulent Garden: This clever little garden contains strange and beautiful plants that originate from all around the world. These plants have adapted themselves to life in dry arid climates, and they grow wonderfully at the Florida Gardens as well. Butterfly Garden: This is one of the newest gardens in the FBG that is devoted entirely to these beautiful and elegant creatures. Located outside the welcome center, visitors to the garden can take in the whimsical atmosphere, while walking on a mosaic of stepping stones that were created by volunteers who work in, and help maintain the gardens. Bromeliad Garden: Most bromeliads grow best in a shady environment, which makes this area of the Florida Gardens an especially nice place to visit in the hot summer months. This collection of plants is known for displaying all the colors of the rainbow. Palm Garden: Palm trees are among the world’s most important plants economically. Palm trees provide oils, building materials, fiber, and food, all of which help the world economies keep churning. Wedding Garden: Hundreds of local couples have chosen the Florida Botanical Gardens as the site for their weddings. This walled garden is both sizeable and elegant, and is an excellent choice for those looking for an outdoor garden wedding. Tropical Walk: Here visitors and guests can take a quiet and peaceful stroll along a well shaded tropical path. Big thick foliage and exceptional colors come together to create an immersion into the tropics. Tropical Courtyard: This quaint courtyard at the Florida Botanical Gardens are a great place to take a lunch break, or just to kick back and relax on a balmy afternoon. Scented plants spread out across the many standing planters add a pleasant fragrance to the area. Natural Area: For well over fifty years these sixty acres were used for agriculture. Now, using a broad range of land conservation practices, nature is reclaiming this site that was once overgrown and already a wide diversity of animal and plant life has moved onto this land.